The 2018 Gold Humanism Society inductees. 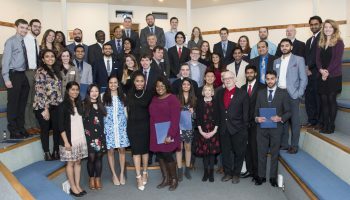 The School of Medicine’s Gold Humanism Honor Society welcomed the 2018 class of inductees during its annual induction ceremony on Jan. 20 at Diastole. It is the 15th consecutive year that the UMKC chapter has recognized students with induction into the national organization. More than three-dozen new members were chosen — 17 students and 20 who are residents, fellows or faculty members. The students were selected from nominations made by colleagues and faculty based on their excellence in clinical care, leadership, compassion and dedication to service. Members are selected for their exemplary care of patients and their humanistic approach to clinical practice. Dr. R. Stephen Griffith, M.D., and Dr. Glenn E. Talboy Jr., M.D., were this year’s faculty inductees. Established in 2002 by the Arnold P. Gold Foundation, the Gold Humanism Honor Society today has 30,000 members nationally in training or practice. It recognizes 149 undergraduate medical education and 14 graduate medical education chapters at medical schools throughout the country. Dr. R. Stephen Griffith, M.D. Dr. Glenn E. Talboy, Jr., M.D.